Jack of all trades kind of hawker stalls are becoming a common phenomenon nowadays. If you want to find stalls that sell just 1 item in food centres, that might equate to you trying to find a needle in a haystack. It is actually quite sad to see how out of sync those ‘Master Of 1 Food’ type of stalls are with the rest of those japalang stalls in markets nowadays. You see, food businesses are becoming very competitive due to the higher operating cost therefore it makes all senses for hawkers to diversify their ‘portfolio’. So outsourcing becomes a reality because there are simply too much to handle and that’s how commercialisation began. The authenticities of the food go down a bit and these entrepreneurs hawkers have to think of other ways to make themselves ’special’ to stay ahead in the game. So gone are the days when they can depend on just one niche to attract the queues because it just doesn’t pay to specialise anymore, lest you have a smaller targetted pool of audience which of course can limit your earnings. But the good thing out of all these is that we can get more creative food because now food sellers have to think out of the box and break away from the norm. And it’s exactly this reason that food stalls like Jia Xiang Sliced Fish Soup & Noodles exist. At the corner of Rangoon Road and Dorset Road at Farrer Park sits a noodle stall that has menu with lists so long that it might just put some Cze Char stall’s menus to shame. 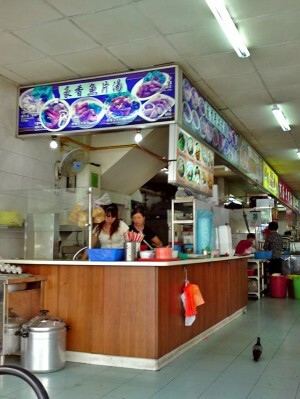 They have many different types of soup items like sliced fish, fish head, seafood, dumpling soup to different types of noodles like bak chor mee, fish ball noodles, abalone noodles to all different types of appetizer items like guo tie, fried prawn roll and so on. Now all these are proof that they are a ‘Master of None’ type of hawker stall but yet after passing by the coffeeshop a few times, I was just ‘feeling itchy’ on this occasion to try one of the items on the menu which is the Seafood Bak Chor Mee. 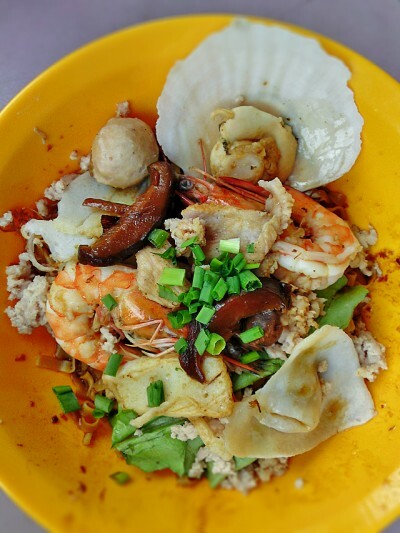 For $6, you get a bowl of Bak Chor Mee which has the common Bak Chor Mee ingredients like bak chor(minced pork), pork slices, sliced fish cakes, braised mushrooms and with additional ingredients like 2 king prawns, a scallop with shell and several fish dumplings. Compared to Ah Guan Mee Pok Pte Ltd, this one loses a bit on the chilli shiokness but it is doused with a type of black sauce(tasted like a mix of lor bak gravy and sesame oil) which is quite shiok nonetheless. Won’t call this outstanding but I guess the extra ingredients are what you’re paying the other $3 for. 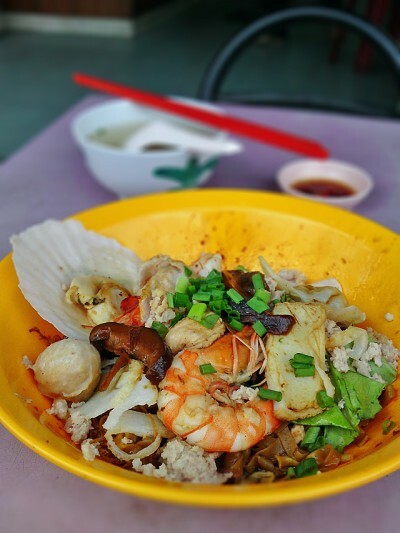 This bowl of Seafood Bak Chor Mee is proof that we have a new breed of hawkers who wouldn’t mind to introduce contemporary ideas to food they sell which is very a welcomed move for our local food scene. I guess these new ideas more than make up for the lack of authenticities in the food otherwise. Conclusion: Not the shiokest bowl of Bak Chor Mee around but you will get fulfilled if you are a seafood lover who just happens to want a bowl of Bak Chor Mee. 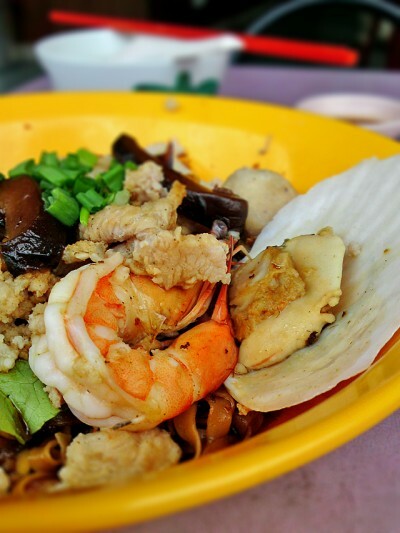 Likes: Getting seafood in bak chor mee. Dislikes: Chilli shiokness no enough.